Natural stones are inherently beautiful and aesthetically appealing. They evoke a tranquil and elegant vibe when placed on different properties – whether commercial or residential. It is no wonder that natural stone is a top favorite for home and outdoor improvement projects. Slate, which is abundant in the Vermont area, is one of the best stone choices for homes and commercial buildings. Flagstones and marble, on the other hand, are durable, long-lasting and highly prized pieces. Natural stone requires expert hands and years of experience to handle. It requires precision and skillful dexterity, which is what we at Rainbow Acres Landscaping are known for. Our team of professionals have been trained to handle even the most complex stone projects as evidenced by our long list of clients in Addison, Bristol, Vergennes, Middlebury, Burlington, Brandon, South Burlington, Jericho, Essex Junction, Montpelier, as well as neighboring areas. Our stone masons have extensive experience and well-versed in the properties of various stone types. Experts have long agreed that the best flooring material is natural stone. A natural stone floor may be a bit more expensive compared with other materials, but it is truly beautiful and lasts for decades. It is also very easy to maintain and polish. Our company recommends different types of stones for different purposes. We can show you how marble and granite can transform indoor flooring into an elegant conversation piece. For home exteriors, flagstones, sandstone and travertine can be used as pavers to elevate the outdoor areas to something cozy and elegant. 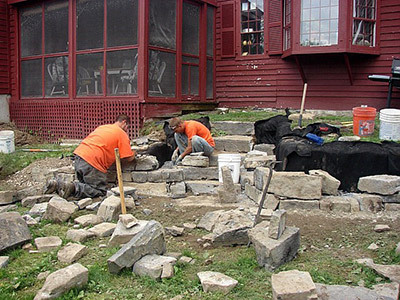 Majority of Vermont homes and commercial spaces use concrete for retaining walls. While these materials are inexpensive and easy to work with, its composition makes it prone to damage when exposed to the elements. The better option is to install stone walls. This kind of wall has been proven to last for decades and looks infinitely more beautiful than cheap poured concrete. Our team of professionals can build you natural stone walls, which will fit your personal style and budget. Alternatively, you may opt to choose a natural veneer for your walls. It is used for walls and other vertical applications and can adhere to drywall, paneling, metal, concrete and even plywood. At Rainbow Acres Landscaping, we prefer to use thin stone veneers for cheaper costs and easier installation. This helps you save on material cost and assures you of faster project completion. We recommend natural veneers for projects that need to be completed in a short period of time. Residential and commercial properties benefit greatly from the appeal of natural stones. A natural stone tile like marble, for example, can infinitely enhance the appearance of a ballroom or receiving area, making it look exclusive and elegant. Vermont is a proud producer of slates, and this is why it is the most frequently used material in our projects. Besides abundance, slate is also versatile and flexible. It is ideal for steps, sidewalks, and walkways. Flagstones, on the other hand, are best for patios, walkways and other paved surfaces while travertine, which can be polished into a smooth and shiny surface, is popular for garden paths and paved patios. At Rainbow Acres Landscaping, we have access to all kinds of natural stones. Our team of experts can work on any natural stone type, color, size, and shape to improve the appearance of any home or landscape. Give us a call today.